The street-scape changes forever when a small-town street man dies. I see him now rushing from his van - the one with the road visible under the floor, and the sliding door that wouldn't slide. The van is left abandoned with the engine running on a double yellow. Mike Lawlee is in a mad hurry to lay off a bet for Browne Bookmakers in Paddy Power before the price is gone. Mike is togged out in just-below-the-knee shorts, and his varicose veins are purple slugs. He wears a straw hat like a cowboy would wear on his day off, and his shorts would fall down without the wide-as-a-motorway multi-coloured braces. The white tennis socks are worn inside the sandals and his glasses are hanging off him like a necklace in case he forgets them in the bookies. The sandals flip-flop-flap faster and the tempo increases. Lawlee only looks out in front, like a soldier going over the top. He rushes into the betting shop. Man on a mission, and it was top secret. No leaks here. The bet was down. Just in time. We lost Mike last week. He was part of our town, part of us, one of our own, part of our growing up and part of our winding down, a man made by us and himself, but a man who will never be made again. He was what is known as a character. Everyone loved Mike. He was the man who couldn't say no to a request for help. Lawlee had a heart of gold but his heart was only working at 20pc. The heart that helped so many killed him in the end. His brother and four sisters were all around him when he was jumping the last. He loved each and every one of them and they loved him. He was only 65. When my poor old dad was on the way out himself, his death bed was very uncomfortable. Mike made four trips to Tralee for a hospital bed, but every time there was some bit missing or broken or didn't fit. There were times when Mike's execution didn't quite match his resolve. My dad said: "I'll be dead and buried before Lawlee comes back with the bed." But back he came, on the hottest day for years. Lawlee was dripping with the sweat. And Dad slept sound. He loved Lawlee. They were neighbours. Dad 'got' Lawlee. Once, I was due in France to write about a Munster match but I got excited and drank too much the night before. So I call Lawlee at 4am and ask him to drive me to Shannon. I slept all the way to the airport. "We're here" said Lawlee. It was Kerry Airport. "Is there a boat?" he asked. I still made the game in time. Mike was a penciller for Browne Bookmakers back before laptops. He had a phenomenal head for figures. 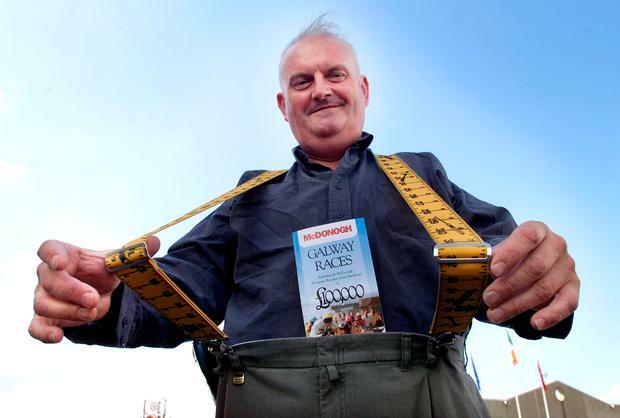 I see him again at Galway Races. The bets are flying in. It's as hot as hell. Eric Browne shouts the odds out to Lawlee. This is make or break for the year but Mike never makes a mistake. His brain was wired for maths. I look down. Lawlee's feet are planted in a basin of water. Eric's border collie Butch is drinking from another basin. There's a crush to rush to back at Browne's better odds. Lawlee asks me if I know anyone who has a barber's chair for a man looking for one. Eric threatens him with instant death. The story of the mattresses sums Mike up. Lawlee traded in second-hand goods such as cookers. He even sold an old floral pee pot as a flower pot. Mike was often given the job of clearing out the houses of the deceased. Sad now isn't it? His own house is next up. It will be some job. The unsold uncollectibles are piled high as the ceiling. There is no great sale for second-hand mattresses. And the local council warned Mike that burning was illegal, on a number of occasions. The mattresses were piled as high as a house in Browne's yard and a neighbour suggested, jokingly, that Mike should bring them to Ballybunion Golf Club where they could be used as coastal protection from the pounding of the Atlantic. Mike duly arrived at the prestigious golf club with a van full of mattresses but his gracious offer was declined in a very abrupt fashion. Lawlee once drove me to Cork for a colonoscopy as there's a sedative involved. Dr Billy Stack comes in behind the screen with the picture of my colon. ''Do you see the redness there?" says Dr Billy pointing to the lit up shot of darkest me. "I do Dr Billy. You better fix that up," says Lawlee, who had snuck in behind the screen unbeknownst to us. That was Lawlee. He never worried about himself. He only ever worried about us. Lawlee was just so generous, and he brought presents to kids. He would empty his pockets for a good cause, and I mean empty. Mike never charged a poor person for the use of the van. We are all distraught. The only way to cope is by telling the stories, as if in some way the recall is keeping him alive. I should be walking down town soon to check to see if the pub is still there. Sunday was his day for a few pints and a few bets. I'm not sure if I can face the street today. Mike was very close to bookmaker Berkie Browne and his wife Kelly. It was Berkie who told me the sad news. "He's a saint now Berkie," I said. And Berkie, with tears in his eyes, replied: "He was a saint when he was alive."